This week on Dezeen, Snøhetta completed the "world's largest underwater restaurant" in Norway, while the Vessel at Hudson Yards in New York sparked censure over its ownership of visitors' photography. Snøhetta opened its aptly named Under restaurant on Tuesday, which plunges into the sea from the craggy shoreline in the remote village of Båly in Norway. 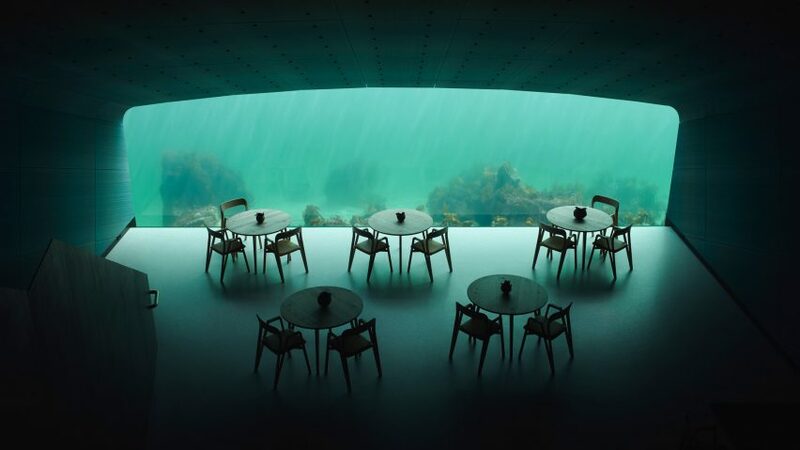 Fronted by a huge panoramic window to offer visitors a "unique view" of marine life, Under is Europe's first underwater restaurant, and will also serve as a marine research centre. Thomas Heatherwick's giant honeycomb-like sculpture, which has just opened at New York's Hudson Yards, caught people's attention this week as plans to maintain the rights to any photography taken of the structure came to light. The decision sparked debate on social media, as people claimed that it questioned the nature of public spaces. Less controversially, this week the 85.4-metre-high Mjøstårnet tower in Norway was verified as the world's tallest building to be constructed using cross-laminated timber (CLT). At the opposite end of the size spectrum, micro homes were also popular with viewers, as we rounded up 10 floor plans of small living-spaces in cities. In transport news, we interviewed designer Paul Priestman about his involvement in creating the interiors of the Airbus A380, following the news that production of the aircraft will be coming to an end. He described the task as "a dream project for a designer" and credits the plane as having shaped the future of aircraft design, claiming that we wouldn't be where we are today if it weren't for the A380. Over in the design sphere, Central Saint Martins product design graduate Marie-Claire Springham invented a "chestfeeding" hormone kit that enables fathers to lactate so that they can help to breastfeed their babies. Design studio Seymourpowell developed the concept for a gadget called Élever that downloads makeup looks seen online and directly prints them onto the user's face using 3D-fabrication, facial recognition technology and AI-powered image analysis. More news of the Tokyo 2020 Olympic Games began to emerge this week, as a set of 50 retro-style sport pictograms were unveiled that pay homage to those from the 1964 Tokyo Games, and the Olympic torch was revealed ahead of next year's Games. Designed by Tokujin Yoshioka, the rose-gold Olympic torch features five fluted sections that form the motif of a traditional Japanese cherry blossom flower when viewed from above. Other popular projects this week included IKEA's colourful Wildhomes for Wildlife, an education centre shaped like a giant neuron cell designed by the late Will Alsop, and a new technique pioneered at Australia's RMIT University to turn carbon dioxide back into coal.